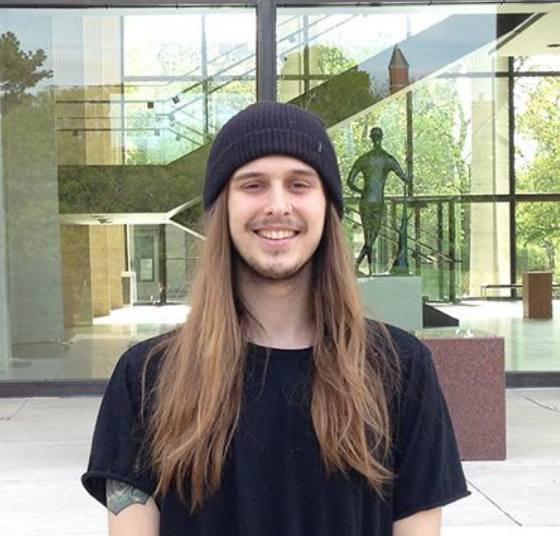 Jake Headid, who graduated in May with a studio art degree with an emphasis in graphic design from the School of Art, Art History & Design, won the University of Nebraska–Lincoln’s first Franco Fund Scholarship. In recognition of Vice Chancellor for Student Affairs Juan Franco’s final year, the Character Council created this new $1,000 Franco Fund Scholarship, which will be awarded annually to outstanding students of integrity who have given their time to philanthropic organizations. In November 2016, Headid was one of 30 students named to “Franco’s List,” which recognizes students identified as demonstrating the positive characteristics that are part of being a person of integrity. Syron said Headid was an easy choice to nominate for the honor. An avid skateboarder since he was eight years old, Headid committed himself to The Bay in Lincoln, an indoor skatepark and community, which organizes Skate for Change. Skate for Change combines skateboarding and outreach. Originally from Elkhorn, Headid transferred to Fremont while in high school, where he has always been active in the skateboarding community. Headid has also been involved with AIGA (American Institute of Graphic Artists) Students in Design group, where he served as treasurer. During his junior year, Headid suffered a setback when he was diagnosed with cancer. He received funding from the Student Emergency Fund, supported by the Hixson-Lied Endowment, which helped him out during his illness. Following graduation in May, Headid will be working for the non-profit called I am Second, where he will be participating in the Vans Warped Tour that begins June 16 in Seattle and travels across the country before ending Aug. 6 in Pomona, California. He’ll be able to share the story of his cancer diagnosis and overcoming it. He hopes it turns into something more. Last summer, Headid worked with Syron on a video project in Minnesota and Wisconsin. He likes the social justice angle of design. He’s enjoyed his experience in the School of Art, Art History & Design.